Welcome to the website of the Black Isle Men's Shed. "A Men's Shed is a larger version of the typical man’s shed in the garden – a place where he feels at home and pursues practical interests with a high degree of autonomy. A Men's Shed offers this to a group of such men where members share the tools and resources they need to work on projects of their own choosing at their own pace and in a safe, friendly and inclusive venue. They are places of skill-sharing and informal learning, of individual pursuits and community projects, of purpose, achievement and social interaction. A place of leisure where men come together to work." 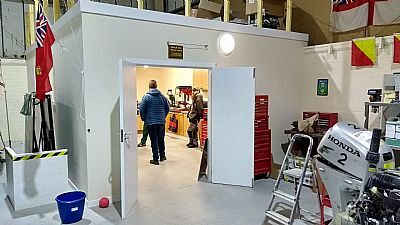 There are now some 430 Men's Sheds in the UK with over 10,000 members and a group of like-minded men from the Black Isle have now come together to form the Black Isle Men's Shed. Thanks must be extended to the Avoch Sea Scouts for accommodating us and for their help in the construction of our new shed. In particular, we would like to thanks Donnie McLeod, Gregor MacMillan, Derek Martin and Ian Jack for their expertise and physical assistance. The Diary Page will be kept up to date with details of our planned activities as and when they have been finalised. We have also set up an email list which will be used to keep members and potential members up to date - please use our Mailing List Page to join it. If you would like to become a member then please click here to download an application form which will open in a new browser window. If you would like to contact BIMS for any reason then please use the Enquiries Page. BIMS is open to all men and we would welcome any help and support in these early days so just get in touch if you think you can help or if you think you might want to attend any of our meetings.